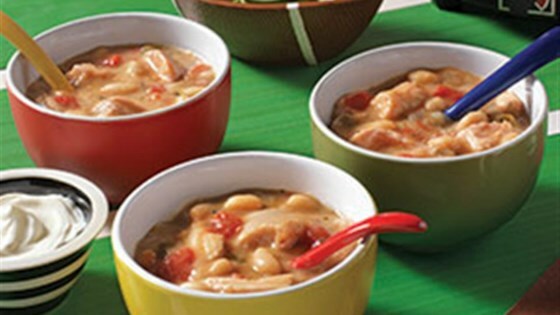 "A slow cooker recipe for white chicken chili assembled quickly with chicken thighs, canned beans and zesty tomatoes." Spray inside of 4-quart slow cooker with cooking spray. Place 1 can of beans in slow cooker; mash with potato masher or spoon until smooth. Add second can of beans and all remaining ingredients to slow cooker; stir to combine. Cover; cook on LOW 8 hours or on HIGH 4 hours. Carefully separate chicken into bite-size pieces. If a thicker chili is desired, drain 1 can of beans. Chili may be topped with a dollop of sour cream and served with a lime wedge. Did you know PAM leaves up to 99% less residue? Use it to combat hours of cooked-on food by spraying PAM on the inside of your crockpot before use. You'll avoid annoying residue and save time on cleanup. My husband really enjoyed this chili recipe. It is so easy to make and has great flavor. Spraying Pam on the crockpot insert does help keep the ingredients from sticking. I followed the cooking tips and drained 1 can of beans so I could have a nice thick chicken chili to stick on top of some tortillas. This was a great, warm, comforting meal! Excellent recipe! Really the only thing I changed was using chicken breasts because we aren't big fans of dark meat. Yum-o! Great taste! Was worried since I never make white chili but turned out great.